Kris talks with Angela Kim, founder and owner of Savor Beauty. They discuss what motivates Angela and what has been the most challenging aspect to growing and scaling her business. Angela Jia Kim’s passion for beauty began with her mom. “Koreans are obsessed with their skin, and my mom always had something new sent over from her sisters in Seoul,” she says. “I would play with her creams that were filled with ingredients like gold and silkworm cocoons.” Angela spent her early career as an award-winning concert pianist, until one day, onstage in front of hundreds of people, a so-called natural lotion she had applied made her break out in hives. Horrified, she began to study ingredients and craft her own skin care products in her kitchen. “I added luxury ingredients with tremendous skin benefits like champagne, caviar, and truffles,” she says. Now Angela runs a group of holistic facial spas in New York City’s West Village and Upper West Side, and in upstate New York. She continues to develop luxe organic products in the Beauty Kitchen with her team of Savor Spa Estheticians. Her Dollars & Scents initiative hires women who are transitioning back into the workforce, by giving training and tools to develop new skills. They make and ship the beauty creams fresh from the Hudson Valley in New York. Angela Jia Kim is a former concert pianist, wife to a Swissman who loves to brew craft beer in his spare time, and mom to a second grader CEO and a yellow lab named Ella Fitzgerald. They live in New York City’s Upper West Side. What it is that drives Angela to continue to excel and grow and take on new challenges. What the big areas are that you need to be conscious of as a woman who runs her own business. What the hardest part was of bringing other people into the business. Angela’s biggest insight to share with women around accountability. What Angela loves most about her business. Elon Musk – (paraphrased) If you’re going to become an entrepreneur and build a business, it’s like eating glass, and in order to be successful you must swallow the glass, too. Set up a time to meet with Kris on her website here. Like the podcast? Please post a comment or review on iTunes. Haven’t joined my subscribers email list? You can go here or email me at support@leadershipcoachllc.com and let me know you’d like to be added to the mailing list. 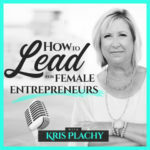 If you know a woman who runs her own business, please tell her about this podcast. Subscribe by your favorite method and my podcast will come right to you! Ep #5: Who Are You as a Leader of Your Team?